It seems like we just can’t get away from those damned dirty apes — not that a lot of us actually want to! Now BOOM Studios is premiering a brand-new Planet of the Apes full-color comic book series this April, written by Daryl Gregory (an award-winning novelist) and illustrated by Carlos Magno. The story this time takes place prior to the original 1968 Planet of the Apes movie, a time when humans and apes have formed an unsteady truce — very unsteady, it seems. 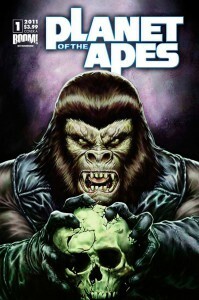 Ape Central.net (a division of ComicBookMovie.com) has the story, as well as links to the brand new Planet of the Apes movie Ceasar: Rise of the Apes, starring James Franco and directed by Rupert Wyatt. Recently the film’s premier was moved back from this summer to this coming Thanksgiving. Posted in: Comic Book News, Movie News.